To celebrate the release on 12 October of the film ‘Suffragette’ (for which I was an historical consultant) I will post each day an image of a suffrage item that has passed through my hands. For my current catalogue – No 189 – which contains a good deal of suffrage material – as well as general books and ephemera by and about women – see here. Pank-A-Squith was a board game, first advertised in Votes for Women, 22 October 1909. The board is green and purple and the spiral track illustrates the difficulties encountered by Mrs Pankhurst and her supporters. It is played by throwing a die to move figures around the board – like Snakes and Ladders. 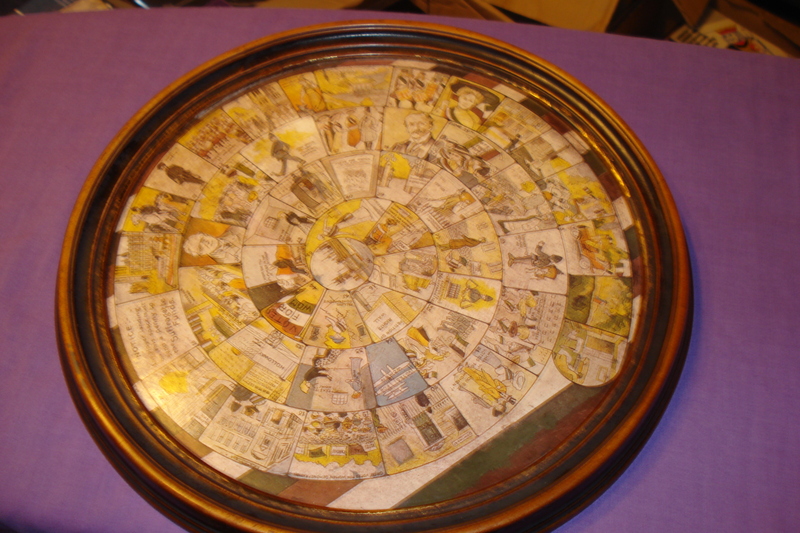 As issued the board was square but this particular board was altered at some point in order to set it within a circular wooden frame. All too often the figures that were issued with the game – and were moved around the board – are missing. In December 1909 Mary Blathwayt, a keen WSPU supporter from Bath, recorded in her diary that she had bought a game of Pank-A-Squith and in July 1910 that she and Annie Kenney played it together as they passed an anxious time while Annie’s sister, Jennie Kenney, was being operated on at Mary’s home, Eagle House, Batheaston. This entry was posted on September 22, 2015, 7:57 am and is filed under Collecting Suffrage, Suffrage Stories. You can follow any responses to this entry through RSS 2.0. You can leave a response, or trackback from your own site.